Valley High School was locked down briefly this morning while the SAPD pursued three suspects who fled from the police, according to the O.C. Register. 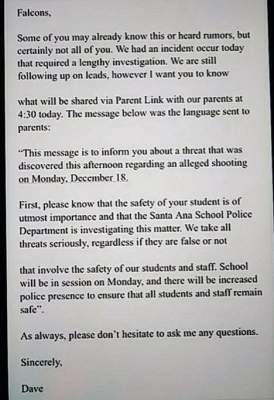 One of our readers sent us a note tonight regarding a threat that was discovered regarding an alleged shooting that was supposed to take place tomorrow, Monday, Dec. 18, at Santa Ana’s Valley High School. ORANGE – Santa Ana Valley High School is one of two winners countywide in the Orange County Transportation Authority’s Chalk, Walk and Roll contest promoting the benefits of active transportation, such as walking and bicycling. 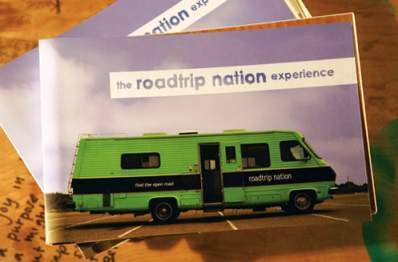 Students at Santa Ana Valley were among seven finalists who submitted artwork from their campus. 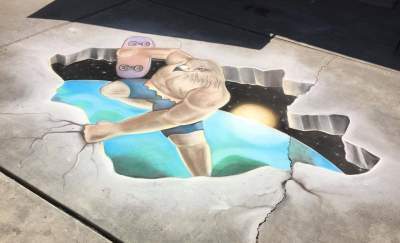 Their winning chalk drawing shows a skateboarder with the head of a falcon – the school’s mascot – appearing to break through the sidewalk. On Tuesday, March 21 at about 7 p.m., an SAPD police officer heard gunshots in the area of 400 West 16th Street. A 19-year old female Hispanic shooting victim later arrived at the UCI Medical Center suffering from a gunshot wound, according to SAPD Case # 17-07613. The victim sustained a non-life-threatening injury to her lower torso. 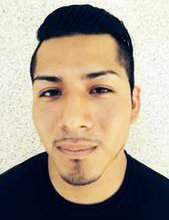 There were two more shootings in Santa Ana on Friday, Jan. 6. In the first incident SAPD police officers responded to the area of Harvard and Griset Streets, at 4 p.m., after receiving a report about a shooting, according to SAPD Case Number 17-544. SAPD police officers responded to the area of 2000 West Elder Ave., in Santa Ana, on a report of a shooting that had occurred shortly after midnight. (Santa Ana, CA) – The Culinary Arts Team of High School Inc. at Valley High School did it again! 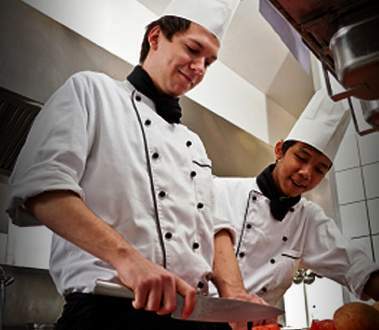 They are the national champions of the Cooking Up Change Culinary Arts competition for the fourth time in five years. Congratulations to Rosa Aguilar, Daisy Lagunas, and Mariah Macias for proudly representing Santa Ana while facing tough competition from nine other cities across the United States to bring home a 1st place finish. 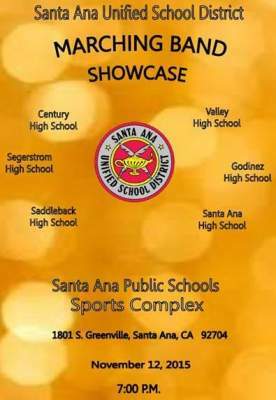 Come and hear the sounds of SAUSD’s High School Marching Bands on November 12, 2015, at 7:00 p.m. at the Santa Ana Public Schools Sports Complex. SANTA ANA, CA., (August 20, 2015)— With a focus on preparing students for college and careers, students participating in the High School Inc. program at Valley High School in Santa Ana, California are experiencing a near-perfect graduation rate. Santa Ana Valley High School, which has an enrollment of about 2200 students, reports that 98.5-percent of students who completed the three-year High School Inc. program are graduating. “The program has nearly a 100-percent success rate, which is incredibly compelling statistics” said Donnie Crevier, High School Inc. Foundation Board Member. 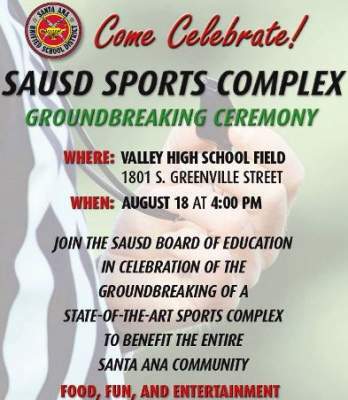 What: Celebrate the groundbreaking of the highly anticipated Santa Ana Unified School District Sports Complex. Thanks to the passage of Measure G, a facilities improvement bond to construct and maintain the condition of the district’s school facilities, students in the city of Santa Ana can finally have a sports complex to call their own. Although the Sports Complex is located on the grounds of Valley High School, it will be jointly used by all of the district’s high schools. Who: Members of the SAUSD Board of Education, Superintendent, Elected Officials (State, County, and City), students, athletes, coaches, parents, and community members.